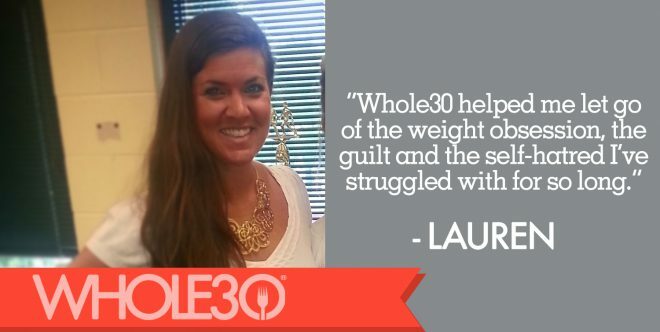 Here at Whole30 HQ, we prefer to celebrate non-scale victories over weight loss when we share Whole30 success stories. In fact, there’s an entire section in The Whole30 all about how to identify non-scale victories in almost every area of your life at the end of a Whole30 reset. We’ve seen this mindset influence our Whole30 community on social media, where posts about these victories (or #NSVs as they’re called on Instagram) pop up in our feeds all of the time. 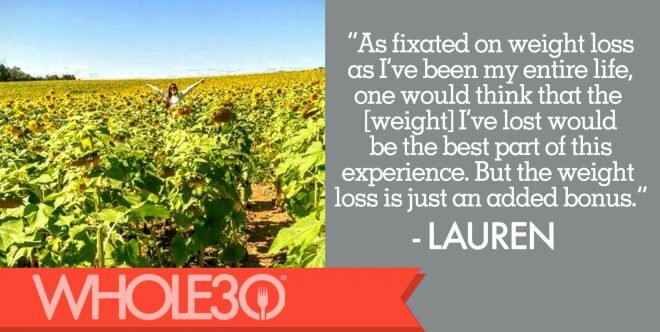 When Lauren sent this fantastic list of her four non-scale victories, coupled with her emotional and brave journey to food freedom, we knew we had to share it here. Growing up in a large Italian family, food was always a huge part of my life. We ate dessert every night after dinner, and my parents frequently placated and bribed us with sweets. I was overweight as a child and have struggled with my weight and my relationship with food my entire life. I was flooded with teenage body image issues and overwhelmed by not only my feelings of shame and disgust in myself, but also by my feelings of jealous and envy towards my skinny friends. After about a year of doing nothing about it, I decided that going from middle school to high school was a good time to “reinvent myself.” I started dieting. I lost weight fairly quickly and for the first time in my life, people were complimenting me on how I looked. And it felt incredible. I never wanted that praise and attention to stop, so kicked my “diet” into high gear; a calorie-counting and scale obsession. The more weight I lost and the more people noticed me, the less I would eat and the harder I would push myself. By my junior year of high school, I was officially diagnosed with anorexia by our school nurse. I finally conceded that maybe there was a problem, but I was never forced into any formal treatment or therapy. I slowly began to eat again and then I was off to college–where everything changed again. I loved college and lived it up to the fullest, complete with all of the drinking and terrible eating choices. The weight quickly added up and after a while, those same feelings and body shaming issues from 8th grade came flooding back with a vengeance. And thus began the constant yo-yo effect for my entire adult life. It was the same cycle over and over: gain weight; self-loathe and guilt myself into dieting; diet for a couple months; lose weight, feel good and slowly loosen up on my dieting regimen (whatever fad diet I would follow at the time) until I was back to eating crappy foods. And the cycle goes on and on. 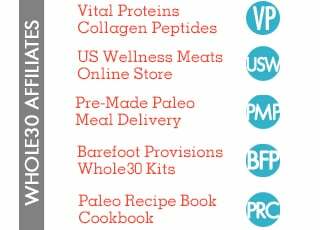 I first heard about Whole30 a few years ago and briefly read the program rules. I didn’t even make it through the first page of the website before I dismissed it as a crazy fad. A few years later I was suffering through another bout of insomnia, and surfing the web for natural ways to cure it. I found an article that suggested an elimination and reintroduction diet to identify any food source as the possible cause of insomnia. I bought It Starts with Food that night, finished the entire book before day break and my life changed forever. I can’t even type that without tearing up–I am eternally indebted to the authors for saving my life. The Whole30 is not a weight loss program, but that was my biggest reason for starting. However, by the end of my first 30 days, I knew this was so much more and I had severely underestimated the profound impact it would have on my body AND my mind. 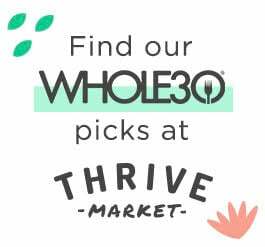 Before starting my first Whole30, I suffered from chronic back pain, endometriosis, acne, irregular periods, migraines, minor depression, insomnia, ADD, and chronic stomach issues. After my first 30 days, my back pain was less severe, my skin was considerably clearer, I didn’t have a single migraine, I was happier and had less mood swings, I was sleeping soundly through the night and my stomach wasn’t bothering me at all. It dawned on me that I didn’t even know how awful I was feeling all the time, until I knew what it felt like to feel so great after my first 30 days. I am now wrapping up my fifth Whole30. I could go on and on about the laundry list of health issues that are no longer issues for me at all. As fixated on weight loss as I’ve been my entire life, one would think that the 40+ pounds I’ve lost would be the best part of this experience. But the weight loss is just an added bonus. There are four things–all non-scale victories–that resonate most deeply with me. I developed a healthy relationship with food. I cannot stress this enough, I have never had control over my eating habits. I was Queen of the Land of Food with No Breaks. In such a short span, Whole30 taught me how to be in control of my food, and not the other way around. It has taught me how to focus on food for nourishment rather than for reward or punishment. 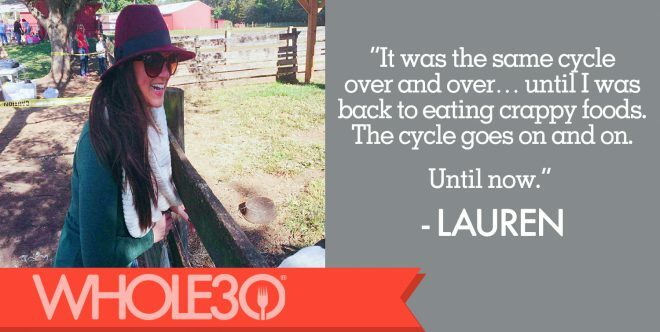 By simply eating only nutrient-rich foods and eliminating sugar (the source that fed my Sugar Dragon), Whole30 helped me let go of the weight obsession, the guilt and the self-hatred I’ve struggled with for so long. Words cannot express how liberating this is. For as long as I can remember, I have equated health with how much I weighed and being thin. During some of my extreme dieting, I weighed myself constantly. Now, I don’t even own a scale. I feel healthier, more alive and more in control than I ever have. My energy, self-confidence and overall happiness are through the roof. Before I started the Whole30, I was aware that somewhere along the way I had become a completely different person. I was constantly tired, I was surprised by my own pessimism and negativity and how often I was in a bad mood. I found myself snapping at people I care about for no reason at all. My job requires me to put in a lot of hours and I had convinced myself that I was just overworked and exhausted. All I wanted to do was stay at home and “do nothing.” I started bailing on plans with friends so often (even when I wasn’t working) that eventually, friends and family stopped inviting and including me in plans altogether. I wasn’t happy with anything in my life and there were several days where I could barely get out of bed at all. And that scared the crap out of me. Within the first few days of Whole30, I realized I was smiling and laughing a lot and my overall demeanor was drastically improved. I felt happy and vibrant and confident. I started making plans and was excited about taking my life back. I’ve been more involved and have had more fun in the past few months than I have in the past few years combined. I feel like I can enjoy life again, and I have the boundless energy to do it. I learned how to control my Adult Attention Deficit Disorder diagnosis. I was diagnosed with Adult ADD my freshman year of college. For over 11 years, I have been taking gradually increasing doses of Adderall to treat the symptoms. For the past 6 years, I have been taking the maximum allowable dosage for adults. Towards the end of my first Whole30, I was beginning to experience some of the negative side effects of the medication, side effects that I had not experienced in almost 10 years. After talking to my doctor about my Whole30 and these sudden changes, he implemented a gradual weaning process. Five months later, I’m only taking 10 mg/day as needed. Just for added emphasis: in five months, Whole30 markedly improved my brain function and essentially cured my ADD. No more cellulite. I have had cellulite on the back of my thighs for as long as I can remember, even as a kid. And I have tried EVERYTHING to get rid of it: expensive creams, scrubs, laser therapy, dry brushing, targeted exercises, vacuum therapy. You name it, I’ve tried it. After just 30 days, I noticed a significant reduction. By the 45 day mark, it was gone. Not going to lie, I actually cried when I tried on a bathing suit and saw that the back of my thighs were completely smooth for the first time in my life. Thank you Whole30, for tossing me a lifeline and pulling me out of the scary abyss of my food addiction. Thank you from the bottom of my heart. 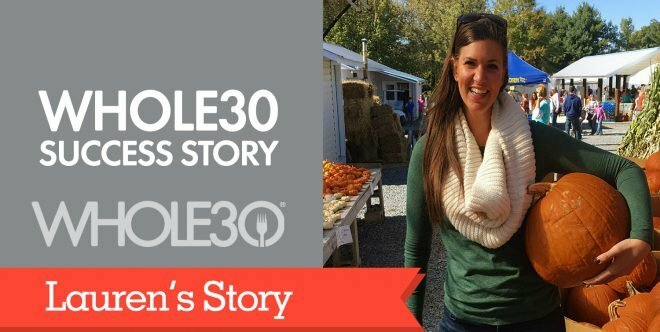 Are you a Whole30 success story?  Share your story with us via Instagram, Facebook, or in an email to [email protected]. Note: If you have a history of eating disorders or disordered eating, we recommend working with a trained counselor before taking on the Whole30, and throughout the course of the program. The rules are rigid, and can be triggering. See this series of articles for more.